Destiny, fortune, success, elevation, luck, felicity. In this symbol I have again followed the reconstruction of Éliphas Lévi, who has furnished several variants. It is legitimate–as I have intimated–to use Egyptian symbolism when this serves our purpose, provided that no theory of origin is implied therein. I have, however, presented Typhon in his serpent form. 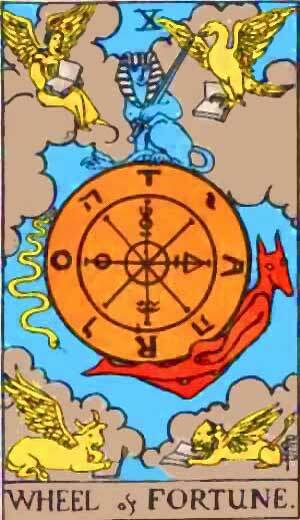 The symbolism is, of course, not exclusively Egyptian, as the four Living Creatures of Ezekiel occupy the angles of the card, and the wheel itself follows other indications of Lévi in respect of Ezekiel’s vision, as illustrative of the particular Tarot Key. With the French occultist, and in the design itself, the symbolic picture stands for the perpetual motion of a fluidic universe and for the flux of human life. The Sphinx is the equilibrium therein. The transliteration of Taro as Rota is inscribed on the wheel, counter changed with the letters of the Divine Name–to shew that Providence is imphed through all. But this is the Divine intention within, and the similar intention without is exemplified by the four Living Creatures. Sometimes the sphinx is represented couchant on a pedestal above, which defrauds the symbolism by stultifying the essential idea of stability amidst movement. 10. The Wheel of Fortune. There is a current Manual of Cartomancy which has obtained a considerable vogue in England, and amidst a great scattermeal of curious things to no purpose has intersected a few serious subjects. In its last and largest edition it treats in one section of the Tarot; which–if I interpret the author rightly–it regards from beginning to end as the Wheel of Fortune, this expression being understood in my own sense. I have no objection to such an inclusive though conventional description; it obtains in all the worlds, and I wonder that it has not been adopted previously as the most appropriate name on the side of common fortune-telling. It is also the title of one of the Trumps Major–that indeed of our concern at the moment, as my sub-title shews. Of recent years this has suffered many fantastic presentations and one hypothetical reconstruction which is suggestive in its symbolism. The wheel has seven radii; in the eighteenth century the ascending and descending animals were really of nondescript character, one of them having a human head. At the summit was another monster with the body of an indeterminate beast, wings on shoulders and a crown on head. It carried two wands in its claws. These are replaced in the reconstruction by a Hermanubis rising with the wheel, a Sphinx couchant at the summit and a Typhon on the descending side. Here is another instance of an invention in support of a hypothesis; but if the latter be set aside the grouping is symbolically correct and can pass as such. The Wheel of Fortune – Good Fortune, Success, Unexpected Luck. 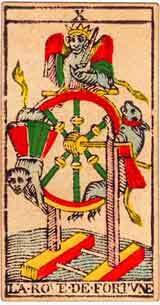 The Wheel of Fortune – A wheel of seven spokes (the two halves of the double-headed cards make it eight spokes, which is incorrect) revolving (between two uprights), On the ascending side is an animal ascending, and on the descending side is a sort of monkey descending; both forms are bound to the wheel. Above it is the form of an angel (or a sphinx in some) holding a sword in one hand and a crown in the other. This very complicated symbol is much disfigured, and has been well restored by Levi. It symbolises Fortune, good or bad. “It symbolises Fortune, good or bad.” (Mathers) So this means happenings, facts. It is indeed in the Tenth house, that the relation between the Self and the Not-self crystallises into fact, happening, deed. Says Papus, identifying this card with the significance of the Hebrew letter Yod, that it indicates “the finger of man; the forefinger extended as a sign of command.” This clearly has to do with the significance of the Tenth house as that of authority and authorities, who are qualified to give commandments. The commandment itself comes under the same resort. “This letter has therefore become the image of potential (?) manifestation, of spiritual duration and, lastly, of the eternity of time.” In fact, the Tenth house of the zodiacal cycle, ruled by Saturn, has much to do with Time and manifestation in time, but not only potential; real as well. The image for this idea is very characteristic, perhaps the most striking of all. “The wheel of fortune suspended upon its axis. (Leaving no doubt about the idea of circular movement in time, which we find back in the horoscope.) To the right Anubis, the genius of good ascending; to the left Typhon, the genius of evil descending . . .” (Papus) See the right hand as the East and the left hand as the West, and you have the illustration of the horoscope more accurately still. As we know the East is standing for the source of spiritual force and inspiration, the West for the end of it and dying out. Corresponds to Kaph and the planet Jupiter, the Greater Fortune. Its influence is expansive, helpful, temperate. Good fortune, a turn for the better, happiness. In questions where the Querant is beset by doubts and uncertainties, the solution of those difficulties. Pride, arrogance, formalism; success turns the head of the person to whom the card particularly applies in the reading. “Pride goeth before a fall” is the clue to the Ill-dignified 10th Key. More information on Wheel of Fortune Tarot card. This entry was posted in Tarot, Runes and Divination and tagged capricorn, destiny, good fortune, horoscope, karma, love, occult, tarot, universe, visions. Bookmark the permalink. ← What Does Your House Number Mean?